Tracing his genealogy online one night, John Eakin landed on a name that evoked an old family sorrow. Arthur “Bud” Kelder, Eakin’s cousin, had died while a POW during World War II, but his body had never been found. Bud’s parents had sent handwritten letters to the Army for years, asking to have their youngest son’s body returned to them in Illinois. “It is our hope that his remains may be sent here, for burial at home,” pleaded one. Six decades later, Eakin, a stubborn Texan who was himself a vet, resolved to find out exactly why Bud had never come home. In the fall of 2009, Eakin reached out to family members and found that Bud’s older brother had kept a trove of historical documents laying out Bud’s saga: the telegram announcing he was a POW, newspaper clippings, letters sent between Bud and his parents. Before the Japanese invaded the Philippines, Bud had worked as a dental assistant at the American hospital in Manila, a plum assignment in a tropical getaway. In late 1941, the Army private wrote to his parents about saving his paycheck to buy a custom-made sharkskin suit. It “really is a peach,” Bud wrote. 1 There are roughly 45,000 Americans “missing in action” from World War II, Korea and Vietnam who are considered recoverable. 2 Despite spending roughly $100 million annually, the Pentagon identifies on average 72 people each year. At the current rate, it would take them more than 600 years to finish the job. 3 Outdated methods contribute to the Pentagon’s slow pace — unlike most other modern efforts around the world, the military doesn’t use DNA as the first and primary means of identifying the remains. 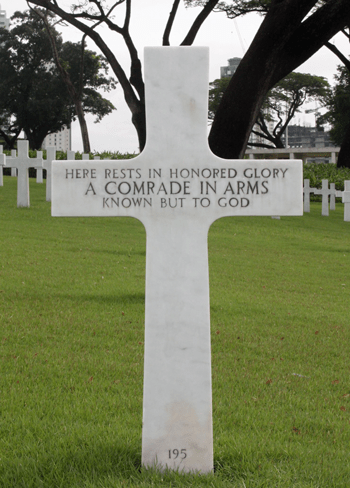 After war broke out in December 1941, Bud was among 12,000 American troops who were besieged by the Japanese for four months on the Bataan peninsula, just south of Manila. The Americans surrendered on April 9, 1942. The Japanese made Bud a driver during the infamous five-day, 65-mile Bataan Death March. He eventually ended up at Cabanatuan, one of the largest POW camps for American troops. When Eakin tried to figure out what happened next, he ran into an unexpected roadblock. The Pentagon spends about $100 million a year to find men like Bud, following the ethos of “leave no man behind.” Yet it solves surprisingly few cases, hobbled by overlapping bureaucracy and a stubborn refusal to seize the full potential of modern forensic science. Last year, the military identified just 60 service members out of the about 83,000 Americans missing from World War II, Korea and Vietnam, around 45,000 of whom are considered recoverable. 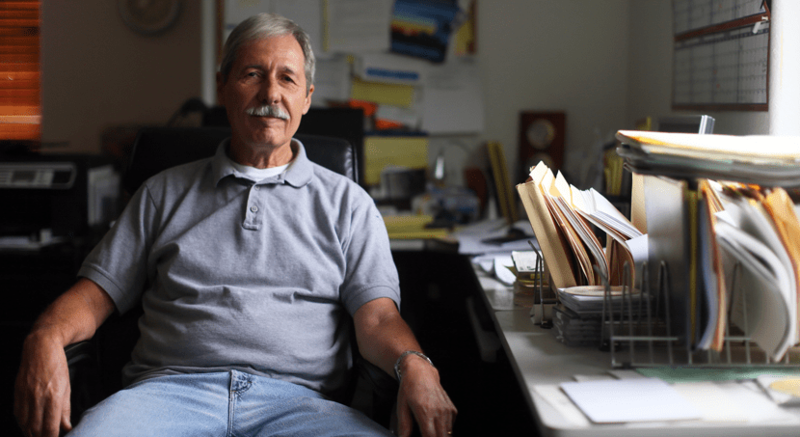 At the center of the military’s effort is a little-known agency, the Joint Prisoners of War/Missing in Action Accounting Command, or J-PAC, and its longtime scientific director, Tom Holland. He alone assesses whether the evidence J-PAC has assembled is sufficient to identify a set of remains: A body goes home only if he signs off. Over Holland’s 19-year tenure, J-PAC has stuck with an outdated approach that relies primarily on historical and medical records even as others in the field have turned to DNA to quickly and reliably make identifications. Though finding missing service members can be difficult — some were lost deep in Europe’s forests, others in Southeast Asia’s jungles — Holland’s approach has stymied efforts to identify MIAs even when the military already knows where they are. More than 9,400 service members are buried as “unknowns” in American cemeteries around the world. Holland’s lab has rejected roughly nine out of every 10 requests to exhume such graves. Holland’s cautious approach is animated by a fear of mistakes. This chart shows how many identifications are made each year by J-PAC, compared to the agency’s budget. Including the other agencies involved in finding remains of missing service members, the Pentagon has spent nearly $500 million over the past five years. In recent years, J-PAC and the other agencies responsible for the MIA program have come under intensifying scrutiny. In 2010, when Congress added World War II to J-PAC’s mission, it mandated at least 200 identifications overall a year by 2015 — a benchmark the agency has already said it will not meet. The problems, including those of DNA, go beyond J-PAC. Last month, Secretary of Defense Chuck Hagel ordered a review of how the military manages the effort. Time is running out. There are 35,000 missing who experts say are findable from WWII. But the MIA’s closest relatives are dying off — and often with them so are the chances for using DNA to finally identify their long-lost loved ones. Working from a home he built by hand in Helotes, just north of San Antonio, the gray-haired, lanky Eakin began his search by requesting Bud’s records from the Army. Barely surviving on a little more than two cups of rice every day, the POWs had still managed to document the deaths of their comrades. It was a monumental task. Of the several thousand prisoners housed at the camp, only about 500 made it out. Each day, the survivors dug a single unmarked grave to bury that day’s dead. And each day, the officers kept a meticulous ledger of the men who had died. However little that death roster meant in the prison camp, later, the POWs knew, it would be crucial to getting the fallen home. The entry for Nov. 19, 1942, lists 14 men. Among them: Private Arthur “Bud” H. Kelder, dead at 4:35 p.m. The 26-year-old had succumbed to pellagra, a vitamin deficiency common among the starved prisoners. Bud’s 34-page file had sat untouched by the government for nearly 60 years, a forgotten folder in a vast repository at the National Archives. Had anyone looked it over, they would have found what Eakin did: The military actually had a pretty good sense of where Bud was. The files included not only a date for Bud’s death, but also a specific grave for him. After the war, the Army had gone to the POW camp to dig up and identify the bodies of more than 2,700 men who died there. 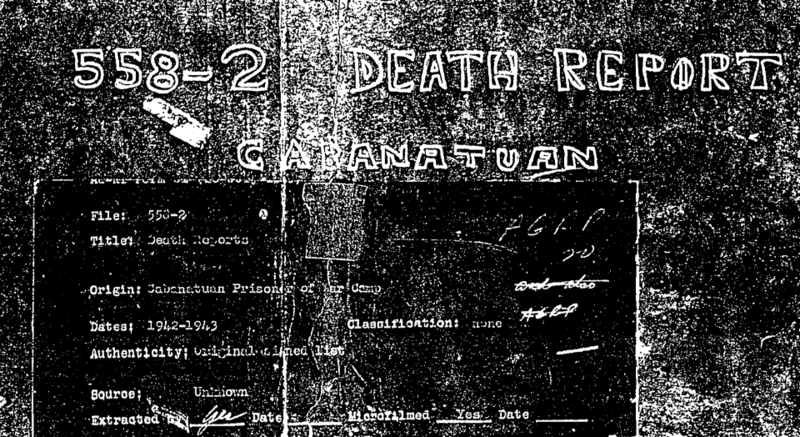 Using the Cabanatuan camp report and recollections of the survivors, the Army numbered the communal graves and matched them with the death list.Bud and 13 others had been in Grave 717. To Eakin, it seemed obvious that Bud was among the 10 unidentified sets of remains from Grave 717 — a relatively small group of bones that the military could dig up and test against the DNA of family members. He tried to make it easier for the Pentagon by tracking down relatives of the men in the grave, so they could provide DNA for comparison. He even turned over an envelope Bud had licked. Bud’s fate rested with Holland and J-PAC’s lab on a joint Navy-Air Force base in Honolulu. With his beard, slightly ruffled appearance, and a penchant for storytelling, Holland has the air of a liberal arts professor. Walking through the hallway outside his lab, he pointed proudly to displays of artifacts found with recovered remains: Tattered uniforms, faded, crinkled pictures and pineapple-shaped grenades. Though J-PAC is a military command, the generals who rotate in and out for temporary assignments take no role in the scientific decisions, leaving them to Holland. Almost a dozen current and former staffers described Holland as someone who bridles at being challenged and fiercely protects his fiefdom. “Expressing dissent was clearly not appreciated and frowned on,” said Leney, who now teaches at the University of Massachusetts Medical School. Leney said he and another anthropologist wrote Holland a memo in 2002 about problems with procedures and standards at the lab. They asked for guidance and clarification. “Here is my guidance:Don’t ever write a memo like this again unless it is stapled to your resignation,” Holland wrote back. J-PAC currently has about 500 employees, including historians and military logisticians to coordinate overseas digs, but it’s work in the lab that people are most likely to conjure. The lab has even been featured on the new “Hawaii Five-0.” (Holland had a cameo.) 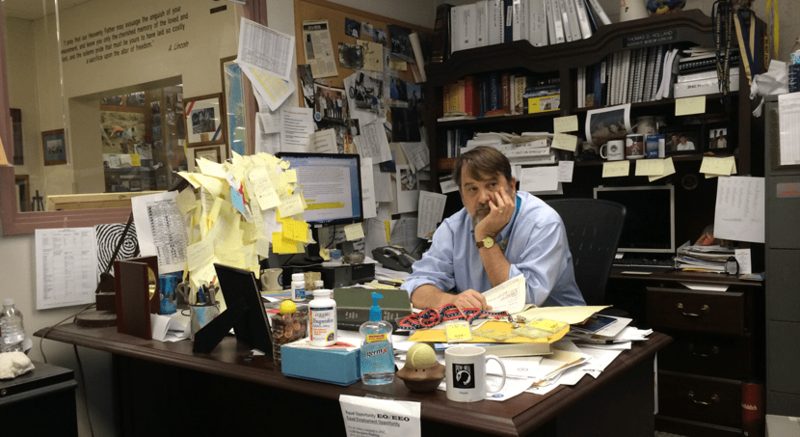 Holland’s longtime work at the lab recently earned him a lifetime achievement award from the American Academy of Forensic Sciences. Swiping his badge and entering the bright, sterile lab, which is not much bigger than a classroom, Holland walked by 16 long metal tables with bones laid out, some with a complete skeletons, and others with pieces of bone that look like piles of jagged stones. Some bones were grayed out like seashells, and others were dark brown, almost burnt looking – the different colors betraying the countries in which they were found. Vietnam’s acidic ground bites at bones, leaving them pitted. One skeleton had a green-tinted sternum and ribs, a patina from oxidation of a copper belt with bullets that was strapped to the vet’s chest. “There’s no formula that applies to every case,” Holland said. Under Holland’s direction, J-PAC’s lab hasn’t prioritized DNA analysis, despite it being an advancement that has revolutionized forensic science. J-PAC’s method begins with historians sifting through archival material to start to narrow down who someone might be. “It may be 100 people, 200 people, 500 people, that’s fine,” Holland said. On June 11, 2011, Eakin filed a formal petition with the Army detailing all the evidence suggesting his cousin Bud could be found. The military has declined to move ahead with the case. What do you make of military’s effort to identify the remains of its missing? Share your thoughts on Facebook or Twitter. Then they compare bones to dental charts and other medical records. Combining that with archaeological analysis and artifacts, they try to winnow down the list to one person. DNA comes in last, only as a confirmation tool. Scientists engaged in similar work elsewhere do the opposite. They start with DNA and let it drive the process, taking samples from bones they dig up and cross-referencing them against databases of DNA from the families of the missing to find a match. Since the earlier 2000s, the DNA-led approach has been used in more than 30 countries to efficiently identify casualties of mass tragedies, including the United States after Sept. 11. In post-conflict Bosnia, scientists initially used the traditional anthropological techniques that J-PAC relies on now and identified only seven out of the more than 4,000 bodies from the Srebrenica massacre, according to Ed Huffine, a forensic scientist who later designed a DNA-led process there. Once they turned to DNA, Huffine said, they were able to make 400 identifications per month at the peak of their efforts. J-PAC does occasionally start from DNA when bones from many people have been mixed together – as they have done with a complicated case involving 500 co-mingled remains from the Korean War. But Holland’s deputy at J-PAC, John Byrd, said the lab rarely needs to resort to that. While using DNA first makes sense in places like Bosnia, where authorities lacked medical records for the missing, the U.S. military keeps copious records. And even advocates of DNA agree that relying on records can make sense in some cases. J-PAC has also faced cases in which DNA wasn’t an option. Soldiers buried as unknowns from the Korean War were embalmed, making DNA extraction impossible. Holland’s team developed a much-admired innovation to get around that limitation, matching clavicle bones to chest radiographs taken to screen for tuberculosis. But those cases are an exception. Typically, Holland’s lab has been able to extract DNA, including on all WWII cases it has worked on. “If we worked together, concentrating on DNA, we could decrease greatly the time it takes to make identifications,” said a current J-PAC anthropologist. Holland’s job has been made harder by the overall military’s failure to systematically collect and sort comparison DNA samples from family members of the missing. Scientists in Argentina, where around 9,000 disappeared in the country’s “dirty war,” started assembling a database of such samples even before they had the technology to analyze them. “We were collecting samples even though there was no possibility to process them, but the relatives were dying,” said Mercedes Doretti, co-founder of the Argentine Forensic Anthropology Team. Later, Argentina launched a national campaign — funded in part by the U.S. government — to collect more DNA, using famous actors and soccer teams to promote it. There has been no such campaign in the U.S. In an era of Facebook and Twitter, J-PAC officials heralded a 2001 Pentagon letter that ran in the widely syndicated “Ask Ann Landers” column. It didn’t work. Fewer samples came in after the letter than before, an Army official said. Huffine and other experts say using DNA effectively requires one central database and single authority overseeing it. But the Pentagon has six different agencies handling aspects of DNA testing and collection, spread out from Hawaii to Delaware. Each military branch is tasked with collecting samples from relatives of the missing from their service. The Pentagon has relatively complete records for Vietnam and Korea but only a fraction of the needed samples from WWII. Nothing was on record for Bud or the others from Grave 717 until Eakin got involved. The Army organizes its samples broadly by war and not by theater, major battle or event. Officials said they had no way to discern how many samples they had in hand related to the Cabanatuan unknowns, for example. Once the military does get DNA samples, there are further delays. The Armed Forces DNA Identification Laboratory, which processes samples for J-PAC, takes 110 days on average to sequence DNA, much longer than commercial labs. “Just waiting for DNA and trying to find a donor for DNA” from a family member — “a lot of the pauses in progress occur there,” a former J-PAC anthropologist said. Eakin first heard of Bud as a teenager, when, looking at framed photographs on the wall, he asked about a black-and-white photo of a young man he didn’t recognize. “That’s Bud,” his grandfather told him in a quiet voice. “That was the only time I saw my grandpa cry,” Eakin recalled. His parents died in the 1960s, without any resolution about their son. Combing through historical records, Eakin learned that his cousin Bud was one of 14 ‘unknowns’ buried in grave 717. Here is how he narrowed it further. Out of the 14 bodies found in Grave 717, the Army immediately identifies Daniel Bain from his dog tag. The Army identifies three more men, and send them home for burial. After looking at the dental records of all 10 bodies remaining, John Eakin finds that only one had gold inlays. Bud had gold inlays. Herman Kelder was Bud’s only sibling. He left his son, Doug, a file box full of documents. 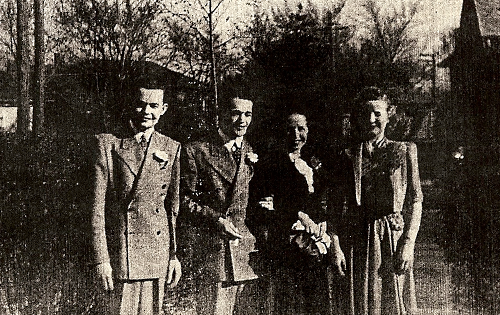 Doug and Ron Kelder, Bud’s cousin, have looked to the dogged Eakin to solve the family mystery. Bud’s story wasn’t meaningful to Eakin just because he was family. As a rowdy teenager in rural Indiana, Eakin joined the Army after a night of drinking with his buddies and did two tours in Vietnam. He wouldn’t easily give up on the cousin who hadn’t been as lucky as he was to make it home. In the spring of 2010, Eakin had two breakthroughs. He tracked down an audio tape recorded by Bud’s older brother in 1994, shortly before he died. Distinctive dental work like that could help identify Bud among the 10 unknowns from Grave 717, Eakin realized. Perhaps the military had noted in its files if any of the bodies had gold inlays. A week after making the discovery, Eakin attended a meeting hosted by the Defense Prisoners of War and Missing in Action Office, or DPMO, another Pentagon agency whose mission overlaps with J-PAC’s. The meeting’s purpose was to update family members on the search for their loved ones, but officials told Eakin that even aided by his new information, Bud was unlikely ever to be identified. Not long after that, Eakin received a package in the mail from a sympathetic source inside the Pentagon: It contained what the government calls X-files for the 10 unknowns buried in Grave 717. 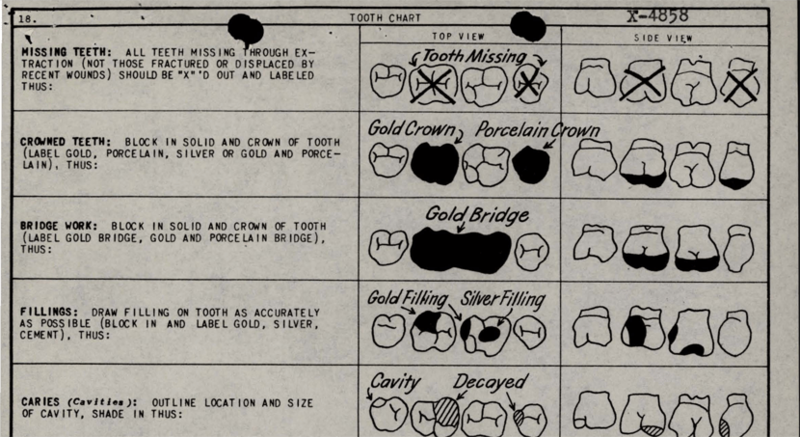 When the military couldn’t identify a set of remains in the years after WWII, it put all the documentation it had assembled — where the body was found, skeletal details and dental charts — into a file assigned an X-number to stand in for a name. 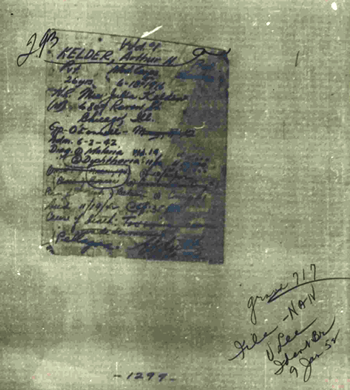 There are about 8,500 X-files from World War II. Eakin went through the X-files for the bodies in Grave 717. Only one — X-816 — had gold inlays.